Although only an EP, Holding Our Breath stands shoulder-to-shoulder with Slowdive's masterful album, Souvlaki. I find Slowdive's music to be a narcotic, and this disc is truly addictive. I think it's a prime example for anyone trying to validate the shoegazer trend in the early 1990's. In fact, I'd play this for some one before the Bloody Valentine's Loveless. Kicking of the EP is one of my favorite songs, "Catch The Breeze." The song is basically the definition of the word "dreamy." Unlike many shoegazing bands, it's not too difficult to make out the lyrics here, and they're not half bad. Of course the real hook here is in the atmospherics. I always felt that guitar effects were a bit of a crutch, but they really are used as their own imaginative instrument throughout this EP. Slowdive also makes the most out of codas on this recording. Even after they've delivered on "Catch the Breeze," they blast into a truly heavenly burst of noise. An even better coda comes in the cover of Syd Barrett's (and James Joyce's I suppose) "Golden Hair." Flirting with blasphemy, I'm going to say that I prefer this to Barrett's version. Rachel Goswell's vocal are beautiful, yet almost disembodied sounding and truly creepy. And they one up the original with an original coda that once again climbs to the heavens. Perhaps they overuse this trick, but they do it so well. The band continues to ride out this groove on the happily floaty "Shine," befor plunging into complete darkness on Albatross. The raging (yet still strangely beautiful) guitars and tribal percussion takes the listener straight into Dante's Inferno. The tom drums in particular never fail to send a cold shiver down my spine. I really can't recommend this one highly enough. Wow! 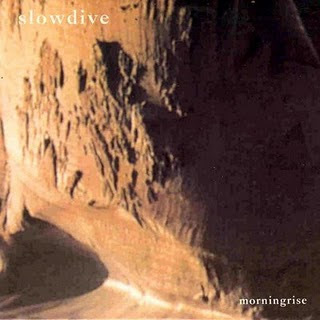 Slowdive takes an amazing leap forward on their second EP Morningrise. Both the songwriting and production are now very much up to speed and I feel matches any of their shoegazing contemporaries. The guitars now reach out for ethereal space, creating a gauze that envelops your brain. Slowdive's rhythm section functions almost like electronic music, eschewing any flashy display to provide a steady pulse and ground the songs as much as possible. The vocals are heavily echoed and doused with reverb, valiently trying to link the more interstellar guitar sounds with the backbone bass and drums. At the end of "She Calls," the vocals finally give up, and lift the song to a new plateau. If there's any fault here, Morningrise (in retrospect) seems almost like a dry run for the band's next single. The title track and "She Calls" both include aural and lyrical suggestions of the next EP's lead-off track, "Catch The Breeze." While both awesome songs, they fall a little short of one of Slowdive's signature songs. The almost ambient "Losing Today" delves into some darker territory that Slowdive would explore in greater detail on later releases. Still, Morningrise delivers the goods. While the first EP did include a few telltale signs, Morningrise is the sound of a band entering the top of the game. We'll just ignore the fact that the title conjures up some dirty images (well, it does for me dammit!). Slowdive was already a step or two behind the British shoegazing scene. Not creatively mind you. At their best, I'd take Slowdive over the more reknown My Bloody Valentine anyday. They never quite had the timing to make it though. While more successful competition like the aforementioned Valentines and Ride had already finished making their names through EPs and were preparing their big album statements, Slowdive stumbled in with their first EP in 1990. 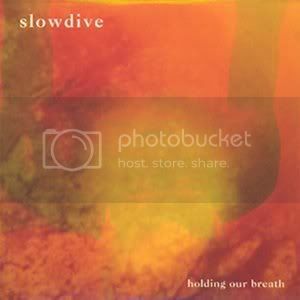 The seeds of what would make Slowdive great can be deduced here, but the eponymous EP does not represent the band in full flower. Slowdive would eventually hit upon a vein of dream pop completely divorced from the blues basis of rock and even had little to do with punk. Listening to most of Slowdive's recordings is a narcotic in and of itself. Unfortunately the three songs (well, really two) here are lacking in a few areas. The first area is production. After this album, the band's recordings would create an amazing, dreamy sheen. Even when blasting at top volume, they still seemed quiet. On the title track of this EP they are noticably loud. Also, while soon the band would master their guitar effects to the point that it's often impossible to tell quite what they're doing, it's a little too bare bones here. Primary songwriter Neil Halstead hadn't quite found his songwriting groove either (for those keeping count, this would be area #2). While both "Slowdive" and "Avalyn 1" have cool riffs, the band basically just pummels them into the ground without much change. This is even more a problem as the third track here is "Avalyn 2," an eight minute instrumental take. The Slowdive EP is basically the band's baby pictures. It's kind of cute, and we get an inkling of where the band is going, but it's definitely more of a starting point than a notable work. Hmm... I think I'm mixing and confusing my metaphors. I'll quit while I'm behind. Except for a few movies, you should be able to sample everything on this sight. Please leave a comment or two; I'm not sure if anyone other than me looks at this blog and I don't really need to download albums that I already own. This collection of unreleased songs and alternate takes from Syd Barrett's two 1970 albums appeared almost 20 years after Barrett jumped ship form the music world to lead a more reclusive life in Cambridge. It's safe to say that the man himself did not have a hand in this compilation. As such, this is basically a clearing house for Barrett's music, and not so much of an album. And the quality here ranges from completely spectacular to unlistenable. The title track and "Swan Lee" are the major revelations here. Both of them could have easily replaced some lesser tracks on The Madcap Laughs (I'm looking at you, side two!). "Opel" has an unfinished feel as there are about two minutes of guitar chords just waiting for some overdubs. Still the melody and lyrics are so great that this doesn't detract at all from the song. Barrett's vocals really work here, and they tend to be extremely hit-or-miss on his solo performances. The abstract lyrics are some of his best ever, not at all succumbing to pretensions or silliness. "Swan Lee" is a more finished product sounding like a submerged surf song, complete with a few Ventures'-like guitar fills. Actually except for the lead guitar and vocals, everything here sounds like it's been reversed, buried underground for 15 years, dug up, and then re-reversed. It's a strange, completely psychedelic sound that I haven't heard anywhere else. Other than the fact that the backing track occasionally threatens to fly off the rails and become completely un-synched (which I find charming), I have no idea why this one stayed in the vaults. The American Indian narrative that makes up the lyrics is fun too, although not on the order of "Opel." Just a notch under these stellar tracks is "Milky Way." It's a great song with a fine demo-quality acoustic performance, but it really could have been fleshed out a little more with some overdubs. Barrett armed with only an acoustic guitar was a risky proposition in the late 60's. It's not hard to see why "Birdie Hop," "Let's Split," "Dolly Rocker" and "Word Song" stayed unreleased. They aren't particularly well composed and the performances are unhinged in a bad way. Those of you who hang on every one of Barrett's words and fractured performances will probably love these. I just can't bring myself to do so. Well, I do have a strange affinity for "Dolly Rocker." "Lanky, Pt. 1" is the last of the new tracks present here. I believe the idea here was to create something in the mold of the Barrett-led Pink Floyd's "Interstellar Overdrive." Unfortunately, by this time Barrett's mental state did afford him the attention needed to do this. This track is basically a five-and-a-half minute long mess. But it is almost the only glimmer of Barrett's signature lead Telecaster that we get in his solo career. The rest of the tracks here are alternate takes. Many of them resemble the album versions, but simply without the overdubs. I tend to prefer the more complete versions on the albums. "Wouldn't You Miss Me (Dark Globe)" is a little different as Barrett sings it in a much lower register, but I miss the singing in the shower quality of the Madcap version. The standout alternate take here is "Clowns And Jugglers," a completely different version of "Octopus." Unlike "Octopus," Barrett is backed here by the Soft Machine. They struggle to follow Barrett even more than the cuts that they appear on on Madcap (which I guess is why it was unreleased), but it's still a lot of fun. I particularly love Robert Wyatt's drumming on this cut. Since he can't really stick with a beat as Barrett keeps changing it, he has to be particularly ingeneous. There's enough here to warrant obtaining Opel, along with two of Barrett's very best songs, but it's definitely a mixed bag. This is a must for fans of Syd, but listening to Opel often feels more like an archeological exercise than an enjoyable listening experience. Also, the cover image creeps me the hell out. Atem (German for "breath") is a transitional album in the best sense of the word. Having taking the minimalist concept to the extreme on Zeit, the Dream returns to somewhat of a space rock vibe. There actually is a fair amount of percussion here, especially the raging torrent of the first few minutes of the side long title track which excitingly builds until it crashes into an ambient soundscape, thus giving the ambience more context. It's also a lot less bleak sounding. "Fauna Gena" recalls the alien landscape imagery of "Alpha Centauri," although with some added bird-like noises. So with the return of the space rock, and ingenious use of Zeit-like soundscapes, Froese, Franke, and Baumann managed their past work magnificently. Fortunately Atem looks toward the future too. Froese seems to barely pick up his guitar here, more often opting for mellotron. It'sa definite precursor to the entirely keyboard dominated sound that would mark some later albums. We also hear the first glimmers of sequencing at the ends of "Fauna Gena," and "A Circulation Of Events." This would become a Tangerine Dream staple starting on their next album (and Virgin Records debut). There are only two things here that really hold Atem back a little. One is the closing track "Wahn." It's far from terrible, but the Ligeti-like voices and percussion recall the undisciplined din of Electronic Meditation a little more than I like. Fortunately, it's the shortest track here by far. A bigger problem is the production. By this time, Tangerine Dream were breaking serious new ground and I doubt there were many engineers who could really record them properly, especially without a state-of-the-art sudio. The opening of the title track loses a little majesty due to murkyness and I bet even "Wahn" would be better with more crystaline sound. Fortunately, the band would get top flight recording after this album with a jump to the majors. It's really worth noting that the first four Tangerine Dream albums almost sound like the work of completely different bands. There are some stylistic similarities, especially one the line up stabilized, but each album is very much its own experience. Even when making a misstep, it's clear that the early Dream was an exceptionally pioneering band and their mistakes are usually interesting. I'll be saying "goodbye" to my Tangerine Dream reviews here, as they become far less obscure starting with the next album. They managed some great major label albums like Phaedra, Rubycon, Ricochet, Stratosfear, Encore, Force Majeure, Tangram, and Logos, all of which I'd easily recommend. As the 80's wore on, they got a little too slick and new-agey for my tastes, but the four albums reviewed here really are but the tip of the iceburg. Hmm... did I call Alpha Centauri minimal? It has nothing on Zeit, which is German for time. The concept here is very metaphysical, as the music here seems to warp the listener's definition of time. The instrumentation is almost exclusively synth and organ (with a few cellos on the first track), but they all blend in a way that it's often impossible to tell what is what. While Tangerine Dream previously working in a space rock genre, here they abandon any link to rock music or popular music in general. In all honesty, this is really a love it or hate it album. Notes move very slowly and it's next to impossible to pay close attention to what's going on. In the Electronic Meditation review of spoke of the definition of music. Here there are no strong themes, but there's plenty of concept and I do have the impression that the players know what they're doing. It is the definition of "atmospheric." The four side-long tracks vary mainly in tone, like different colored crayons. "Birth of Liquid Plejades" consists of long, drone out tones and changes very slowly. "Nebulous Dawn" shifts things with a light clopping rhythm which is mirrored by the bubbling synth on "Orgin Of Supernatural Probablilities." Things shift back to extreme darkness on side four's "Zeit." Usually music this minimalistic has a meditative quality. Zeit's tones tend to be extremely dark and unsettling. It tends to create the bleak vibe of industrial without being industrial at all. I do put it on when I go to sleep sometimes, but I doubt everyone would want to do that as they might end up scared of the dark again. Be careful with this album's volume too. Although the music seems to never rise above a murmur, it in fact gets quite loud at times, which accounts for some of it's unsettling nature. There is no percussion, so that loudness tends to be of a "screaming well of souls" quality. As a fun fact, 70's Tangerine Dream mainstay Peter Baumann joined the band for this album. The bleakness and minimalistic nature here tends to obscure any distinct musical personalities, so Baumann presence isn't really noticable until the next album. I think that if one is willing to "crack the code" on Zeit, it is a very rewarding album and creates a headspace that few other albums do. It is a bleak beauty, however, and probably isn't the best place to start. Here the Tangerine Dream becomes a slithering nightmare. Ok, let's try and assume Electronic Meditation never happened and consider this Tangerine Dream's debut. In a way it is since Edgar Froese is the only member remaining from the last album. Joining him is Chris Franke, who was hired as a drummer but would be the Dreamer to dive head first into the electronic waters and match Froese's influence in the band for the next 15 years. We also have organist Steve Schroyder who would vanish in a drug induced haze following this album. The band's trademark sequencer patterns are still nowhere to be found here, and there is still plenty of conventional instrumentation. In fact, Alpha Centauri is very much a "space rock" album. But we do start to hear experimentation with electronics, particularly the VCS3 synth, which Pink Floyd would also use extensively (no Moogs yet though). The band was from a rock background, and didn't really know how to properly program the synth (although Brian Eno suggests that synth players throw away the manual anyway), but they still conjure up some awesome sounds here. The band is a lot more mellow here. They occasionally whip up some noise, but it's much more controlled than on the last album, and performed with purpose. The players are actually playing off of each other here. Most of the music is minimalist, but arranged and playing with maximum effect. "Sunrise In The Third System" is shortly after takeoff, drifting around the earth. The organ tones have no trouble evoking an orbital sunrise. With the 13-minute long "Fly And Collision Of Cosmos Sola," we launch into hyperspace, with VCS3 patterns streaking by. Eventually we enter the Alpha Centauri system, and make a tricky landing through a turbulent atmosphere. The side long title track would be a tour of this distant planet. Alpha Centauri is an early masterpiece by the Dream. In fact, they'd continue making stylistic changes, and never really return to this sound. There's a great mix of space rock and early avant garde electronics here in a perfect balance. The long and convoluted story of Tangerine Dream 70+album recorded output begins on this unfortunately disappointing disc. It's a shame as the personel present garners very high expectations. Of course mainstay Edgar Froese is here wailing away in his early psychedelic guitar mode. Soon-to-be electronic guru Klaus Schulze appears as the drummer and Ash Ra Tempel's Conrad Schnitzler complete this first version of the band. Even before the release of Electronic Meditation Tangerine Dream would fracture and only Edgar Froese made it to album #2. The problem here is that Electronic Meditation is not a properly thought out or conceived album. There is some gobblygook about a "cycle of life" concept glueing the album together, but the fact is that this was basically a recorded rehearsal. None of the members ever thought of this as their first album. The tapes found their way to the brand new Ohr label, who wanted to put the recordings out as one of their first releases. Finding themselves in need of income, the Dream consented to this. The cover art and title are extremely misleading. We see a heavily wired modular synth looking thing tied to a doll. Especially considering Tangerine Dream's (and Schulze's) later role as electronic pioneers it seems safe to expect that this is an album focused around electronic sounds. For better or for worse, this is really a very psychedelic guitar/bass/drums album with a touch of flute and just a few synthesized sounds basically functioning as sound effects. Still, there are of course plenty of great albums with traditional instruments. The bigger problem is that there are no melodies here to speak of or any sort of forward motion. The band doesn't seem to have any purpose or goal. They're basically screwing around. In fact the only thing resembling a theme shows up in the only standout, "Journey Through A Burning Brain." Even here though, the theme explicitly recalls Pink Floyd's "Saucerful Of Secrets" and the revised version of Tangerine Dream would create a far superior track like this on their next album. I teach English to Japanese students, and in my discussion class last week we tried to define the line between noise and music. I have a wide definition and would still classify this as music. One student thought that if the music is played by professionals, it is music, even if it is very avant-garde. So, that too would classify this as music. Other qualifiers included having a theme and/or concept. For the most part this album is lacking those (except for what seems to be a tacked on concept), and about half of my class probably would not call Electronic Meditation music. I'm not here to slam Tangerine Dream. The 70's Dream in particular were certaintly one of the most ground breaking bands around, and second only to maybe Kraftwerk in terms of electronic music. But I highly recommend starting with the second album. Give this one a try if you're a completist and are already familiar with Tangerine Dream's later masterworks. First off, I think that I have to admit that this album is a bit of a guilty pleasure for me. 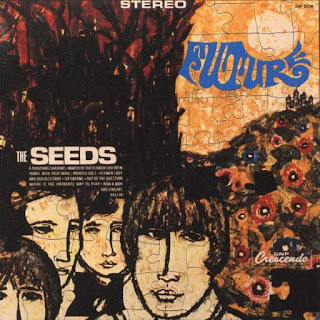 The Seeds, while a very distinctive band, did not possess the talent of the best, or even above average artists of 60's rock. On their psychedelic opus, Future, we hear the sound of a band that has a huge recording budget, but no clue what they're doing. Fortunately, what they ended up creating is a wild 60's pop art display, which contains little nuance, but tons of charm. Future is the sonic equivalent of a 60's cult film like The Trip. The Seeds began life a few years prior to this recording as a prime garage/psych band out of LA. They'd already scored a few minor hits with "Pushin' Too Hard" and "Can't Seem To Make You Mine." They cashed in on their newfound clout to create this weird and freaky distorted mirror image of Sgt. Pepper's. The strange thing is, Future is arguably a more fun album than that Beatles classic. Let's hit the bad points first. Sky Saxon was a notably crazed singer, but he didn't really have the focused punch of somewhat like the 13th Floor Elevator's Rocky Erickson. Without the sonic adornments on this album, his singing easily becomes tiresome after a few tracks. The Seeds compositional skills were also far from enviable. The songwriting usually doesn't stand out much here, and when it does it's practically a rewrite as on the "Pushin' Too Hard" clone "The Flower Lady And Her Assistant." What raises this album to classic status for me is in the execution. "The Flower Lady And Her Assistant" is a far from original composition, but the disorienting harps and strangely meandering clarinet takes song into a brand new realm. Something like "March Of The Flower Children" becomes a great song because it ends up pointlessly and manically orchestrated with blaring horns and a tuba replacing what would normally be the bass line. The album continues with other random kitchen sink productions culminating in the epic length and wildly strange "Fallin'." Film director Ed Wood is often cited as the worst film director of all time, but I disagree with this sentiment. Although his technique is painfully inept, his love and joy of filmmaking shows through in something like Glen Or Glenda and makes his films incredibly entertaining. I think the same thing applies her. The Seeds sound like they're trying to convey what they believe is an important message and create high art, and they're having a blast doing it. It doesn't matter that they really didn't have the talent to create another Sgt. Peppers because they're having so much fun trying. Fortunately, they also had a lot of money to make this quixotic attempt, and that just makes Future all the more charming. This is far from a masterpiece of psychedelia. It is, however, a lot more fun and entertaining that many of those classics. Future gives "guilty pleasure" a good name and inhabits a special goofy place in the pantheon of 60's rock. Note: The buy me link below includes A Spoonful Of Seedy Blues on a two-fer. I find that album much more dull and ill-fitting with Future, but it is the best place to get Future on CD. Aphrodite's Child made a serious change of gears on their second long player, It's Five O' Clock. Whereas on their first disc they were firmly a strange psych-pop band, they try to adopt a more country-rock sort of vibe here with just a few hints of psychedelia. That's right, a Greek band playing country rock. They really don't do a bad job of it at all. Unfortunately, the eccentricities that made the first album so interesting are mostly smoothed over here and the overall sound is much more bland and less distinctive. In fact, I had trouble believing thart this was the same band until the fourth track, "Annabella," where Roussos finally returns to his amusingly overly dramatic vocals. Some of the songs, while well written, don't really take off until the band gets onto more of a freaky jam mood as in the second half of "Let Me Love, Let Me Live." Aphrodite's Child still maintains interest as a truly organ driven band on many of the tracks, but there are far more guitars present here. I guess you can't really do country rock like "Wake Up," "Take Your Time," "Marie Jolly," "Or Such A Funny Night" without some strummed acoustic guitars. For better or for worse, none of these tracks are embarrassing, but they do come off as uninspired. These are very much utilitarian compositions. The band tries to reach out in a few different directions on "Funky Marie" and "Good Time So Fine." "Funky Marie" is certainly not funky in the traditional sense, but it is odd with its manic percussion including jazzy vibes and spastically hit bongos. Unfortunately, it's not very good either and is more of a overly stoned jam than anything else. The band fairs a little better trying to create a touch of dixieland on "Good Time So Fine" and mixing it with, uh, hoarse yelping. Still, I'd take, well anything from the first album over this. The title track, which is also the opener, is sort of a rehash of "Rain And Tears" from the last album. It's not bad, but it does suffer from the law of diminishing returns. If I want to hear something like this I'd sooner put on "Rain And Tears." The lyrics are far less noticable on It's Five O' Clock. I guess the singing is integrated in the mix a little more, but I didn't pick up on any of the demented psychedelic cliches which I enjoyed so much on the first album. It's Five O' Clock is a pretty average album. There are a few successful country rock numbers which are worth a listen, but the experimentation often flies off the rails, and the album unfortunately pales in comparison with it's far more distinctive predecessor. Apparently, Aphrodite's Child took a deep plunge into the weird on the next album, 666. I haven't been able to track that one down, but if someone out there can send some mp3s my way, I'd love to review it. 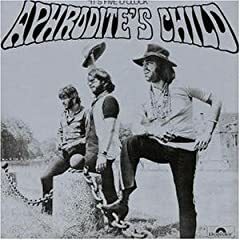 Aphrodite's Child was a Greek band featuring several future musical luminaries. New age/electronica guru Vangelis (of "Blade Runner" fame) shows up here as a multi-instrumentalist and writes the bulk of the music. Demis Roussos, who apparently had a successful solo career in the 1970's is the lead vocalist. This album is their debut and feature some prime, if slightly-skewed, 1968 psychedelia. You've perhaps heard "Rain And Tears," the closest thing to a hit on this album. It's a pleasant organ-led psych track in the "Whiter Shade Of Pale" mold. Fortunately, it's not the best song here as End Of The World turns out to be a very consistent album. I've often heard the early "prog rock" tag thrown at this direction. Although there are a couple of slightly longer tracks (like six minutes) present, the modus operandi here is very much psychedelic pop. We're not looking at multi-part, constantly shifting songs here. I think the progressive elements apply more to the oddball elements of this band. As Greek musicians (who also spent time in Paris), these guys were probably pretty disconnected from the British/American mainline of 60's pop. Demis Roussos seems like he's often horsely belting out the vocals without any restraint in a strange approximation of his counterparts. This often works to enjoyable effect as "Mister Thomas" comes of as much less twee as it would otherwise, and I always get an amusing image of Mr. Roussos blasting from the top of a windswept mountain on the sideways rocking "Don't Try To Catch A River." This is also an early example of an almost guitar-less rock album, which would become a common progressive rock gimmick. Vangelis is quite a keyboard player, however, and I never found myself missing guitar tones. It fact, I really had to pay close attention to the album to notice the lack of guitars. As a warning to fans of Vangelis, the songs here little in common with his solo works, although you might be pleasantly surprised by his different, but great performance here. Lyrically, this album gets a bit strange, perhaps due to the fact that English was not these guys first language. 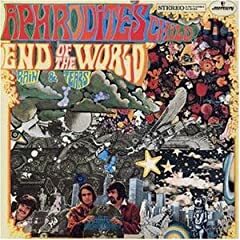 Things are pretty creepy on opening track "End Of The World" as Roussos suggests "You should come with me to the end of the world without telling your parents or your friends," and that he'll "give you anything that lives on earth." It's not an enticing offer from a hairy hippy. As the album continues, we hear plenty of other psychedelic cliches twisted into surreal shapes. The longer tracks, "The Grass Is Not Green" and "Day Of The Fool," break from the basic psychedelic pop mold. Here Aphrodite's Child get a little more progressive, but it's much closer to Days Of Future Passed Moody Blues than "Karn Evil 9." They do manage to end the album on a very creepy, unsettling note filled with decaying organs and sputtering percussion with "Day Of The Fool." End of the World, indeed.